Taraji P. Henson has been acting for twenty years now, having made her film debut in the 1998 film Streetwise, even scoring an Oscar nomination for her role in The Curious Case of Benjamin Button, but only in the last few years has she truly become part of the cultural zeitgeist, thanks to her portrayal of lead character Cookie in the TV drama Empire. Although that show’s star has slightly faded in recent seasons, Henson’s star certainly has not, and thanks to further roles in films like Hidden Figures, she is finally receiving the credit that a long-working actress like her deserves. 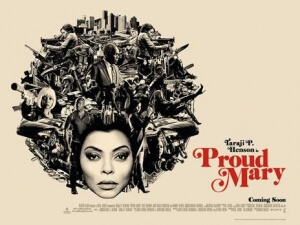 She’s even at the point now in her career where she can be the sole selling point for a small action-thriller like Proud Mary, which is a very problematic movie in more ways than one, but the trailers were correct in showcasing Henson because even though the movie’s not very good, she is by far the best part of it. Henson plays Mary, an assassin working for a Boston crime family fronted by a guy named Benny (Danny Glover), and is someone who we first see pulling off a hit, only to discover she’s just made a young child by the name of Danny (Jahi Di’Allo Winston) an orphan. Flash forward to a year later, and Danny is now working for a rival crime boss who mistreats the streetwise scamp, only for Mary to find him and take him in. She attempts to sever Danny’s criminal ties but in doing so ignites a mob war between her bosses and their rivals, which she must then infiltrate to keep her new young ward safe, no matter the cost. This comes from director Babak Najafi, the guy who most recently did London Has Fallen, and if there was something I could say in favour of the film, you can definitely tell that there’s a bit more passion put into the making of this one than the Gerard Butler sequel. However, that doesn’t necessarily mean that Najafi is a particularly strong action director; in fact, a lot of this movie doesn’t even feature that much action at all, and is mainly just an uninspired and not very interesting crime drama about – stop me if you’ve heard this before – an assassin who forms a strong bond with the child of a target, and goes against the criminals that brought them up in an effort to keep said kid safe. From that vague description alone, you can probably guess how it’s all going to play out, and odds are you’d probably be right. Not that one goes into this kind of movie expecting high art, but something other than the same stock plot we’ve seen countless times before, and not at all done in a fresh or exciting way, would’ve been nice. As standard and stock a script as this may be, the filmmaking on this film alone is pretty weird. The editing in particular is done in a very peculiar fashion, and not necessarily in a good way; it feels sped up somehow, like they’re cutting corners just so they can get this down to under ninety minutes, which would be fine if this was a high-octane and fast-paced action movie, but it’s not, and because of that it comes across as really awkward when scenes of people not doing much can suddenly whizz by in mere seconds. It also has that feeling of being one of those things where they took an entire season’s worth of material from a standard crime show, and then edited it all down to fit into a standalone movie, which would explain why this movie acts like there are large chunks of the plot missing as well as several characters (Neal McDonough shows up for only a couple of scenes, and barely even has any dialogue in any of them), except for the fact that this was how this original movie script was written and then mild-manneredly executed by a director who didn’t really know what to do with it. Thank goodness for Henson, who again walks away with the movie by being her cool, sassy and endlessly entertaining self, albeit in a bit more violent environment. Even though her character isn’t particularly well-written – on paper, she just is one of those good-hearted badasses you see all the time in these kind of movies – she makes it work well enough to give off a strong screen presence, even in scenes where you’re really not sure if what she’s doing is a calculated move or just plain dumb. I’m glad that Henson is at that stage now where her name alone can be used as a selling point for a movie, but Proud Mary isn’t entirely something to be proud of. Proud Mary never transcends from being the kind of crime drama you’ve seen many times over, and not even a strong lead performance by Taraji P. Henson can save it from being a dull and uninteresting waste of time.